In a first-of-its-kind study, University of Notre Dame Assistant Professor of Anthropology Lee Gettler and lead author Patty Kuo, visiting assistant professor of psychology, focused on how dads' biology around the birth of their children relates to their parenting down the road. They partnered with Notre Dame psychologists and Memorial Hospital of South Bend to analyze testosterone and cortisol in 298 men on the first two days of their newborns' lives. "Studies like this give us an understanding of the value of having the dad present at birth and engaging with the baby," said Gettler. "What we see in the special days around birth is that dads' hormones—how much dads are producing overall and how their hormones quickly change when they hold their newborns—are linked to what fathers are doing months later. This relates to how men establish bonds with their newborns as well as with their partners and how they will co-parent." The large number of participants allowed Gettler and Kuo to examine how hormonal changes affect both new fathers and experienced ones. 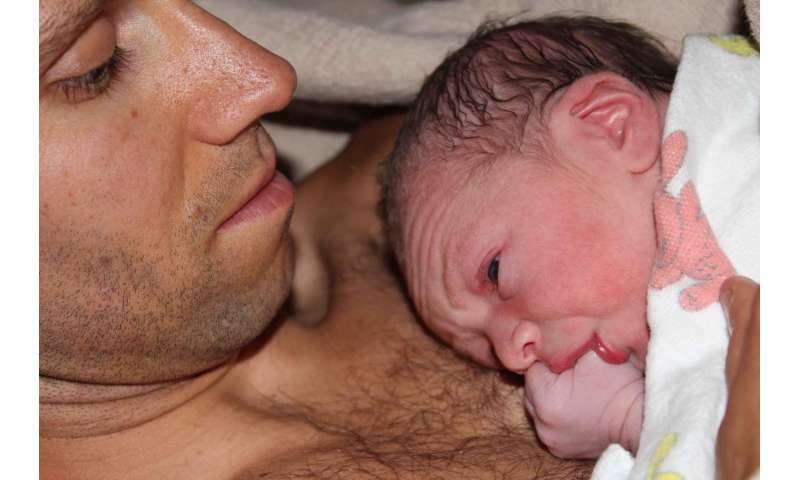 Their research, published this month in the journal Hormones and Behavior, demonstrated that dads whose cortisol levels were elevated while they held their newborns on the day of their birth—either skin-to-skin or clothed—were more likely to be involved with indirect care and play with their infants in the first months of their lives. They also tested men's testosterone on the day of birth and found that fathers' later caregiving did not differ based on those levels. However, if dads' testosterone was lower on the second day of the infants' lives, fathers were more involved in care. These findings align with existing studies, including Gettler's leading research. Labor and delivery nurses at Memorial collected saliva samples from participating dads who held their babies approximately an hour after birth. A UNICEF/WHO baby-friendly hospital that encourages skin-to-skin contact between parents and newborns, Memorial is not affiliated with a university. However, Memorial labor and delivery nurses were excited to partner with Gettler and Kuo because their study aligns with the nurses' goal to encourage interaction between fathers and their newborns. A follow-up survey completed by 180 of the original participants gave Gettler and Kuo insight into the level of care fathers invested in the first four months of their newborns' lives. Cortisol is sometimes referred to as the "stress hormone," but this study and others show that elevated cortisol is not always harmful, but helpful. "We tend to think of cortisol as a 'bad' hormone, but babies do require a lot of care and you do need to be vigilant," Kuo said. "We think that elevated cortisol is a sort of orienting response that can help the body prepare for child care." It's not surprising that cortisol level in dads is high on the day of birth. And, as long as it's not chronically elevated, it can have benefits, Gettler explained. Some data show that this is beneficial in moms as well, since it could make moms more prone to being responsive to their babies' cues signaling hunger or illness, for example. "When we were approached by Dr. Gettler to help in his study, we had no idea it would end up taking two years and 1,600 tubes of saliva," said Patricia De Stefano, manager of the Memorial Childbirth Unit. "Our nurses are very passionate about the involvement of dads in the birth process and were willing to do whatever it took to help children have more involvement with their fathers. We were so thrilled to participate in the study."